since when stuns and ensnares are the same thing? I'm not saying they are, you did little to answer the question and instead pointed out a stupid detail. I'd like to know what you were saying bards are supposedly immune to that they shouldn't be. sorry for my childish question, and would u class dark bonds or blade of hypnosis as a stun? Actually Blade of Hypnosis is a sleep, and Water Bards are not immune to it. You are forgetting the kiting abulity of bards..Which bard with half a brain would just stand there and take the hits..I mean yes you can land hits with flair next moment you are either sleeped or far away from the bard..
You may not upload animated images. BTW yeah dark vamps are immunto slow but not to mana drain and they need vamp form for it...aloso the vamp form should come before the freeze or else you will remain slowed..
you obviously have not met a good dark vampire in arena. there is a reason why people call it the son of perfect world. You are level 60, talking to you is like discussing politics with a 5 year old. What part of "good" dark vamp you didn't get? More like, if those vamps die so fast, it's their fault, their gear. Dark vamps can get 40k+ HP while maintaining 400+ evasion, how is that even remotely squishy? A HP-built sin on the other hand has about 51k HP. An evasion sin would probably have same if not less HP than the dark vamp. So are we talking overgeared vampire vs undergeared classes? Oh dark vamps rule then!!!!!!! I have a 70 kindred edge sin,57 human edge sin and a 60 dark vamp..i believe i know everything i need to know..
Also i believe i pvped more than you ever will...I see you just afking outside AH all the time whereas i do all kinds of rift,1v1,arena,SoO pk and stuff..
Only reason im lower level than you is cause i pvp while you do your henries..
Mist III? Why not Mist IVs? Press I, look at the #1 in arena reputation, that vamp called Akiza. She's on your server btw. So am I. You know, people I fight daily in arena. And funny thing, Akiza isn't even purple geared, but does have champion boots (from GoS, low base for purple though, but 6 eva on add). Do you realize who you're talking to right? That's Shyren's alt. Check rankings sometimes. We've been PvPing since closed beta, he was also the only lv57 in CB and there's even a GvG video on youtube somewhere. SoO PK? that's where mostly noobs gather, sometimes is fun but you don't learn much there. Waiting for the world that is Forasken! Wow at Shyren and Borsook not knowing PvP. I don't think there is an arena that one of them misses, and most nights they fight for world bosses. Yeah they must have zero experience fighting people. dont have to be overgeared. no purples. only 3 12/12. with def pet lv3 hp/ lv 2 eva buff. vamp mode activated. no priest buffs. 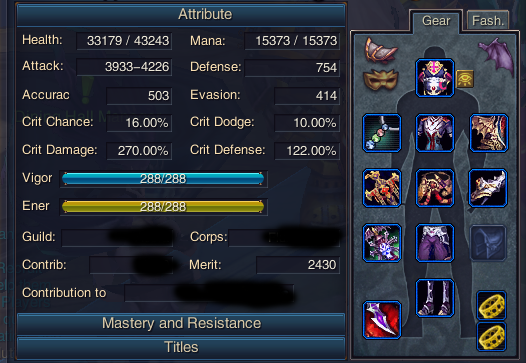 so tell me how is possible get to that 20k HP. and against assasins only hp is good. oh and btw that Water shield isn't so good it can give back only 9%(HP) from my MP so i need even more MP to be good. and after 6 hits it's gone..but it can be increased if i will use D chords ..but still it isn't so good ..btw i would be much glader for reflecting dmg than reducing to 60% of original dmg. The general problem are those percentage effects which just get very strong/overpowered the higher your equip/gems etc are. and for sure some more effects that get stronger and stronger while normal fixed skill boni stay "weak" or getting weaker. 414 is just pet buffed eva .. i am not even in imp form or dark contract yet. I have almoust every equipment 5+5 Eva and i have about 328 EVA, as Bard I think i could have about 350EVA ...no more.I forgot i have 3x lvl 3 and one lvl 4 gems. Pet buff (lvl2 skill - I forgot it's name) will not give you so much extra eva. 7 pieces of eqs that have dbl evasion ids(5+5+5), easiest to do are rings and necklaces(5+5 would reccomend to get one with crit def % or crit chance if u like). full mist IV, + talent. deflection gives 12, gemlight gives 13. 350 is enough for pve mobs, if you want to pvp efficiently at least at above 375 base. Anyway, even at 400+ it isn't enough. The secret behind eva builds is you must have the ability to heal yourself(Vamps,Bloodlust Warrior,Bards) and have high resistances as a foundation. Else you will face yourself dying too quickly to accuracy pumped(champ gears with triple acc ids) DPS/vicious intented sins. If you re-id + resale precise agile ids gears smartly, it won't cost you that much capaital. At the most, 15 diamonds are sufficient. There are periods where evasion ids starts appearing. Plus most people re-id their current gears, with fortifying transfer, you can just buy a new precise agile gear(v cheap on storm) and starts to re-id these new gears instead of re-iding your current eva gears. Once you got an acc + eva id, resell it at a decent price and rebuy sapphire crystals. Rinse and repeat. Patience is the essence, never ever spam re-id scrolls. my vampire has a gear containing triple eva id but meh that gear is too low for me now.. Sins are still OP btw ^_^.